Orange County California is an ideal area to take the family for a vacation. The weather is almost always perfect with the main number associated with the weather in Orange County being 70. Seventy percent of the days during the year in the area are sunny, and the average temperature over the course of the year is 70 degrees. As far as Anaheim California goes, everyone knows about Disneyland. It’s certainly a lot of fun and some would argue the happiest place on earth. Most people associate vacations in the area with Disneyland, but let’s face it – there’s only so many times you can plan for such a trip and it often is all you have time to do when in Anaheim. Yet there are so many other things to do in Orange County, which many people bypass a bit wistfully as they are headed for the Disney gates. Next time you plan a vacation, instead of searching for a different location outside of California, just change your focus. When you take Disneyland out of the picture and do a bit of research, you’ll be amazed at how many other family activities and attractions there are in the area. Choose some of the following suggestions once you’ve had your fill of mice and put together the ideal family getaway that includes a diverse array of options for the whole family. Just because you have a toddler doesn’t mean that vacations are now out of the question until they are older. While it may seem there are few vacation spots that have activities that are age appropriate for toddlers, Orange County has several possibilities. Zoomers Petting Zoo – This attraction is geared especially for preschoolers but has something to entertain the entire family. 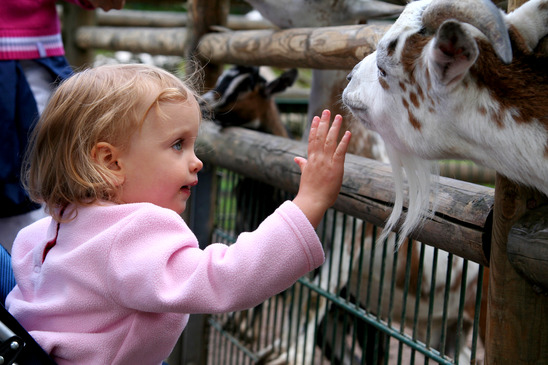 This petting zoo takes safety seriously, allowing young children to pet over 100 different kind of animals without fear of harm. Some of the favorites are potbellied pigs, llamas, sheep, guinea pigs and even a 1000 pound cow among others. There are a lot of other fun things to do at Zoomers including train rides, and pony rides. Your child can even mine for gold, gemstones and fossils at Miner’s Gulch. Seasonal events are also popular such as Pumkinpalooza which occurs during the month of October. The Children’s Museum at La Habra– This museum is designed to ignite the imagination of young children. With seven galleries and 14 unique hands on activities the museum is fun for those of all ages. Some of the activities and attractions at the Museum include a 1942 Caboose, carousel designed specifically for those age five and under, dinosaur topiary filled with flying, and a model train village. Stroll through the topiary to see swimming and land based dinosaurs made out of plants and shrubs, take a nature walk nature walk during which your child will come into contact with preserved and live animals at the Grotto. Your family can learn about experiments at the science station, take part in a live theater production, and make something fun together at the Family Art Center. Pretend City – This small interconnected city is aimed at “building better brains,” using education programs, hands on experiences, role-playing and purposeful play. The activities are led by trained professionals teaching basic reading, science and math skills, while also focusing on creativity curiosity and other essential mental functions. In addition to a fun and unique learning experience, this museum offers developmental screenings and training for families, educators and children’s agencies. Adventure City – Adventure City is economy priced so tickets for a family of four costs about the same as a single ticket for a large theme park. Along with classic rides such as the vintage Carousel, the Giggle Wheel, a small version of the Ferris wheel, and the Freeway Coaster, a pint-sized coaster that fits the whole family, there are seven other rides, most of which are made for the young and the young at heart. Your family will also enjoy the petting zoo, a full size children’s theater, and rock climbing. When you get hungry, drop by Parker’s Filler Up Station and enjoy a variety of food, snacks and drinks. Knotts Berry Farm – Those ages 3 and up will enjoy the variety of rides and attractions at the Farm including stagecoach adventures, the merry-go-round, the soaring Sky Cabin, Calico Railroad, Dragon Swing, and bumper cars. As 2014 marks their 30th anniversary, Knotts Berry Farm is renovating Camp Snoopy’s area and refurbishing the Calico Mine Ride, Knotts first big attraction. The altered landscape and additions to the park are scheduled to open for the 2014 summer season. There are a number of other attractions and activities that are available for families to enjoy when visiting Orange County. Many are appropriate for older children who will be excited at all the options. Flight Deck Simulator – Consistently voted the top place in Orange County to hold a birthday party for kids ages 7 to 14, this attraction will thrill children and adults alike. You and your child can experience the excitement of air maneuvers while flying a fighter jet at 40 knots or taking control of a Boeing 747. Watch the action of other pilots while enjoying the Officers Club. You’ll receive classroom training and in flight instruction so no prior experience is necessary. Discovery Science Center – This one of a kind, experience based museum is fun for all ages. Guests learn about science through over 100 hands-on interactive exhibits and activities. A variety of themed areas will let you and your family experience full force hurricane winds in the hurricane simulator and earthquake tremors at the Shake Shack. You can also measure the size of tremors with a seismograph, make your own clouds at the Cloud Ring Exhibit, and go on an adventure surrounded by life-sized dinosaurs at Dino-Quest. Don’t miss the chance to climb a real rock wall before you leave. Aquarium of the Pacific – Children can experience what it’s like to be a Junior Biologist, through a series of two hour classes which include a gallery tour and behind the scenes opportunities with animal care staff to get close to birds, reptiles and other sea mammals, invertebrates like octopuses and seas stars, sharks and a variety of fish.from all over the Pacific Ocean. Your family can also set sail on several different cruises to nearby feeding grounds where you can watch whales, dolphins and other sea mammals in the wild. Visit the Ocean Science Center, the Marine Animal Care Center and a variety of different marine based habitats. Before you leave, check on the development of the animals born earlier in the year including penguin chicks and sea otter pups. Mission San Juan Capistrano and Cultural Center – The entire family will enjoy the variety of educational activities which focus on the area’s Spanish history and culture Take a guided tour of the museum and explore the grounds which include ten acres of gardens fountains and preserved, adobe style architecture. Experience what is was like to live in San Juan in different time periods as you watch historical re-enactments. Irving Park Railroad – The Irving Park Railroad is a third sized train that takes children and adults through historic Irving Regional Park. Families can also enjoy the parks other amenities including bike and paddle boat rentals, pony rides, and the Orange County Zoo. Special programs are available for holidays and special weekends. Enjoy the view as you walk around the lake, or stop by the equipment rental pavilion then challenge your family to a game of volleyball or horseshoes. In addition to attractions, there are a number of activities available for families to enjoy that are appropriate for children of all ages. Whether your family likes spending unstructured time in the great outdoors, or prefers the stimulation of museum exhibits and arts programs, Orange County has something for everyone. Fossil Hunts – Orange County is a great place for budding paleontologists. Few areas exist where with as many opportunities to discover fossils. Visit Fossil Reef Park, a six-mile long limestone reef that’s over 18 million years old with the fossilized remains of more than 40 vertebrates including prehistoric whales and sharks. Crystallized rock, shells, whale bones and other fossilized remains provide a window into what life was like millions of years ago. Learn about the 140 year search for the lost dinosaur of Irvine and view the fossils of a real dinosaur nest holding the bones of a mother with her babies at the Orange County Dinosaur Museum. Your family can even join a simulated fossil dig at Irvine Ranch Natural Landmarks. Swim Spots – In Orange County there are many places your family can enjoy the water without going to the beach or an upscale water park. Parents with toddlers will appreciate the wading pool at Brenner Park which is for children six years old and younger. Children of all ages can cool off in the two interactive water play areas within Harry M. Dotson Park. This park also features two playground structures, walking paths and shaded picnic areas. Catch a movie, grab a bite at the food court then let your kids play in the water at the Irvine Spectrum Splash Pads. This giant mall has a large splash zone with a fountain and water spraying tortoises popular with older children while a separate, smaller splash area is perfect for toddlers. The Spectrum also has a giant Ferris wheel and Carousel, kiddie train and outdoor playground. Winter visitors can show off their skills on the ice skating rink which replaces the splash zone during the colder months. Take the family to Splash! La Mirad Regional Aquatic Center & Buccaneer Bay for more excitement and see who is brave enough to zip down one of the two-story water slides or jump through the wild spray at the splash zones. The zero depth, lazy river is ideal for toddlers or those looking to cool off at a more relaxed speed. The aquatic center offers swim lessons for all ages year round. Arts Festivals and Programs – Introduce your child to the arts during your visit to Orange County through the offerings at the variety of arts establishments and arts festivals held throughout the year. Special children’s programming is offered by a variety of local companies including the Pacific Symphony and the South Coastal Reparatory. The Arts Teach Program held at the Segerstrom Center affords the chance to view live theater productions and exhibitions presented by over 75 international artists in music, dance, theater and visual arts. There are also numerous family friendly arts festivals offering opportunities to learn about the history and culture of Orange County and surrounding areas. Child favorites include the Rancho Days Fiesta (May), which focuses on local Native American tribes, the Orange County Children’s Book Festival (September), which introduces children to authors and newly published children’s books, and the Art – A – Fair (June – August) which presents the work of over 125 artists along with child oriented demonstrations and hands on activities. Balboa Pavilion and Fun Zone – Located in Newport Beach, Balboa Peninsula is filled with family friendly rides, activities, restaurants and more. Enjoy a leisurely visit with your family as you take in the view from the Ferris wheel or play a variety of games to win prizes at the arcade. If you tire of walking and still have some of the peninsula to see, low cost bike rentals are available. Those who love the water have plenty of opportunities to explore with boat rentals, harbor cruises, parasail instructions and other activities. Fish from the pier, jump the waves or just sit back, relax and take in the beautiful surroundings. There is no need to pack food for the day as numerous restaurants can be found within walking distance of the Ferris wheel. Stroll down quant side streets and stop at some of the unique shops for one of a kind merchandise. Boomers – This giant, outdoor park is filled with activities for the whole family. Race to the finish line on the go-cart track, show your skills on the mini golf course, or see how high you can score in the giant arcades. Other activities you don’t want to miss at one of the two Orange County locations include bumber boats, laser tag, rock climbing and batting practice in a full-sized batting cage. Visit the Irvine location for even more attractions at King Arthur’s Carnival. One price covers all rides and activities in the park. Power House – This family entertainment center boasts that it has games and activities that will thrill kids who are “2 to 102”. With more than 130 interactive video games, PowerTag, and Bowlingo, the high-tech bowling game chances to win prizes, this is definitely not your parents’ arcade. Unending chances to win prizes ensure you won’t go home empty-handed. Challenge friends and family or try to beat the top scores on the newest, large screen video tournaments. Before your visit to Orange County take some time to get to know the area and all it has to offer. With a little foresight, you can plan a vacation filled with activities that are fun for the entire family. If you have a question, please feel free to leave it in the comments below.